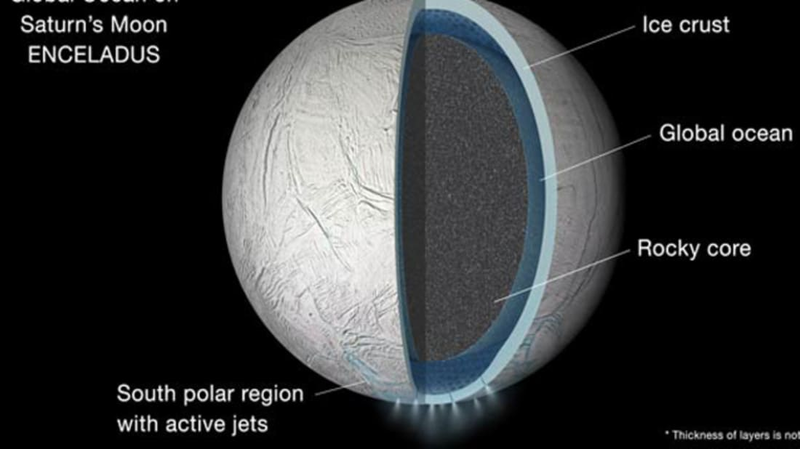 Scientists have long known about the “ice geysers” that spray water vapor and ice particles near the south pole of Saturn’s moon Enceladus. New data from NASA’s Cassini mission shows that this activity is being fed by a vast global ocean beneath the moon’s icy surface. Researchers studying Enceladus’ orbit around Saturn observed that the moon had a very slight wobble. This was an indication that the moon’s icy crust wasn’t frozen all that way through, and that a liquid water ocean was present between its surface and its rocky core. It had previously been suspected that a regional sea brewed beneath the south pole of Saturn's geologically active moon. Gravity data collected during Cassini’s several close flybys supported the theory that the sea was in fact global, and this new analysis confirms that. The Cassini-Huygens spacecraft has been orbiting Saturn since 2004. Enceladus has become of particular interest to the mission because of its potential to sustain life. Among the ice and vapor observed shooting from its southern volcanoes are complex, organic chemicals. The discovery of a liquid ocean further supports its astrobiological potential. It’s still unknown how Enceladus’ ocean keeps from freezing, but one possibility is that the tidal forces from Saturn’s gravitational pull generate much more heat than was once believed. The mission will extend through September 2017, and researchers will continue to sift through Cassini’s data for answers. On October 28, the spacecraft is scheduled to make a close fly by of Enceladus, coming within just 30 miles of its surface.